Happy National Pancake Day 2017! Happy #nationalpancakeday 🥞 Because we could all benefit from some fun news. 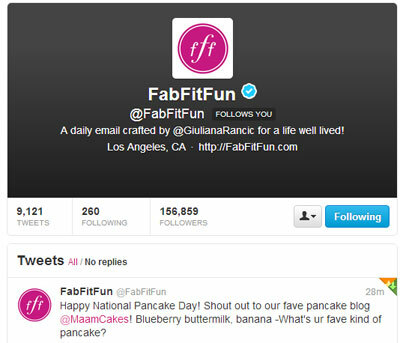 Happy National Pancake Day, FanCakes! One of the best days of the year. Since beginning its National Pancake Day celebration in 2006, IHOP restaurants have raised almost $16 million to support charities in the communities in which they operate. On March 3, 2015, guests from around the country will celebrate a “Decade of Giving” with the tenth annual National Pancake Day at IHOP restaurants and enjoy a free short stack of Buttermilk pancakes. In return for the free pancakes, guests will be asked to consider leaving a donation for Children’s Miracle Network Hospitals© or other designated local charities. Their goal this year is $3.5 million for charity! 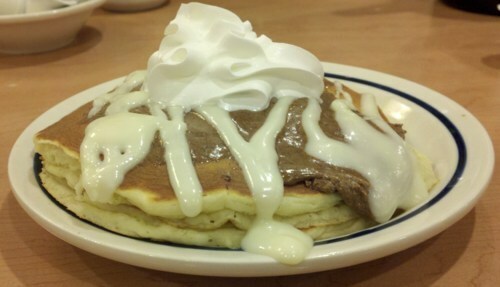 NATIONAL PANCAKE DAY Review at: IHOP! 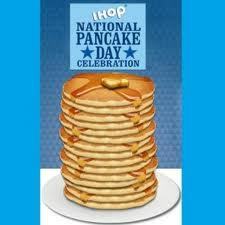 On Tuesday February 28th I, along with the rest of the country, celebrated National Pancake Day at IHOP! 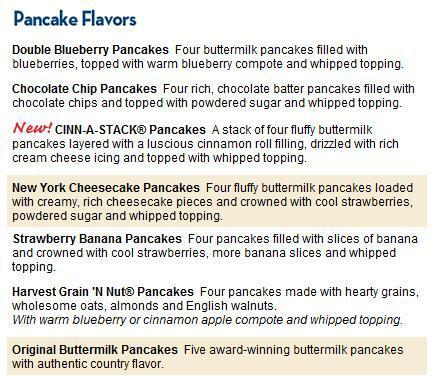 National Pancake Day at IHOP is a day in which IHOP provides a free stack of buttermilk (only) pancakes, in hopes patrons will donate money to the charity, Children’s Miracle Network Hospitals©. As per their website, “Since beginning its National Pancake Day celebration in 2006, IHOP has raised nearly $8 million to support charities in the communities in which it operates.” An entire day designated for Ma’amCakes and fellow Americans to celebrate pancakes and charity?! Sign me UP! I visited the IHOP location on Sunset and Orange in Los Angeles, CA, which, on a normal day, is sketchy-enough; but when you throw in Hollywood bums and free pancakes, it doesn’t make for the safest meal. Fortunately, we only saw one person escorted out by security – but alas, the security guard was sure to carry the man’s to-go box for him upon his departure. I would have gotten a photo if my guest and I weren’t dining underneath our table. Now, we all (myself included) typically think of IHOP as the place to go for cheap pancakes, and as the cure for an evil hangover. 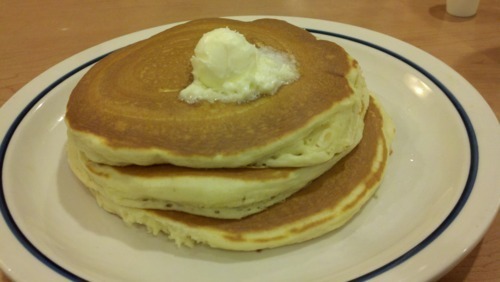 Yes I have been to IHOP a couple of times, but never as a pancake-reviewer. Having not visited the restaurant in a long time, I will admit that I had preconceived notions for how the meal would taste. But before discussing how my predictions were proven incorrect, let’s first discuss how difficult it was to choose my pancakes! Being a New Yorker and loving cheesecake, my first notion was to go for the New York Cheesecake Pancakes – this is definitely a pancake-option I have never seen. In fact, the only reason I didn’t go for this dish is because I was on my lunch break from work, and knew I’d be sleeping in the corner of my cubical upon completion of the meal. So instead, I opted for the New Cinn-a-Stack Pancakes. But I must say, I was pleasantly surprised. Look, these are not gourmet pancakes. Contrary to the title, you’re not going to the International House of Pancakes for an incredible selection of delectable pancakes which should be reviewed by Zagat’s. That being said, for the low price and diner-style entrees, these pancakes were pretty fantastic! The Cinn-a-Stack Pancakes at IHOP were as fluffy as a pillow, fresh, and not-greasy. While the frosting was gooey and a bit much, these pancakes legitimately tasted like cinnamon bun-pancakes. Sure I’ve had cinnamon pancakes, and I’ve had pancakes that tasted like churros (hi Hugo’s), but I’ve never actually had cinnamon bun pancakes. What a treat! My guest ordered the stack of free buttermilk pancakes, which she very much enjoyed as well! Sure today’s pancakes came with a side of crazy, but I’m happy I was able to squeeze in a review for National Pancake Day! Hopefully this year IHOP was able to top whatever was made from its 2011 donations. 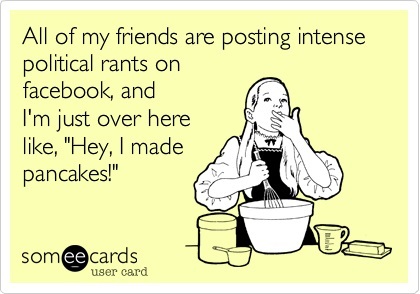 InvadeLA has Wished Ma’amCakes a Happy National Pancake Day! How sweet!